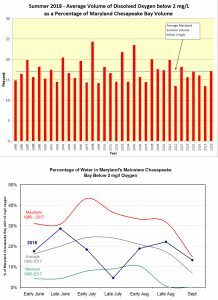 Dissolved oxygen conditions for the Maryland portion of Chesapeake Bay for the summer of 2018 were average compared to the long-term average from 1985-2017, reports the Maryland Department of Natural Resources. Low dissolved oxygen volume averaged 0.97 cubic miles from June through September. Crabs, fish, oysters and other creatures require oxygen to survive. Scientists and natural resource managers study the volume and duration of bay hypoxia to determine possible impacts to bay life. Each year from June through September, the department computes these volumes from data collected by Maryland and Virginia monitoring teams. Two cruises in June were above average in hypoxic water volume (areas with less than 2 mg/l oxygen). These conditions were likely attributable to higher than average spring flows, including almost double the normal rainfall in May. This additional rain and runoff delivers more nutrients, which fuels algal blooms, and in turn consumes oxygen upon their decay. The delivery of high volumes of freshwater also acts to increase water column stratification that can inhibit atmospheric oxygen in the surface layers from mixing into deeper waters. Early July results were better than average, as hypoxia was concentrated in deeper channel areas. Late July saw a sharp decrease in hypoxia, as a result of massive rainfalls in the central/northern Maryland and Pennsylvania portions of the watershed, which resulted in near maximum monthly water flows. This wall of freshwater was accompanied by sustained winds of 20 knots that reduced stratification and mixed oxygen throughout the water column, shortly before sampling occurred. As high flows into the bay subsided, hypoxic volume returned to slightly below average in early August and then slightly greater than average later that month. Final results from a mid-September cruise showed that hypoxic conditions were at a near record size for that time of year as warm weather persisted well into October, and the effects of increased nutrient runoff by high flows likely contributed to lingering low dissolved oxygen volume. 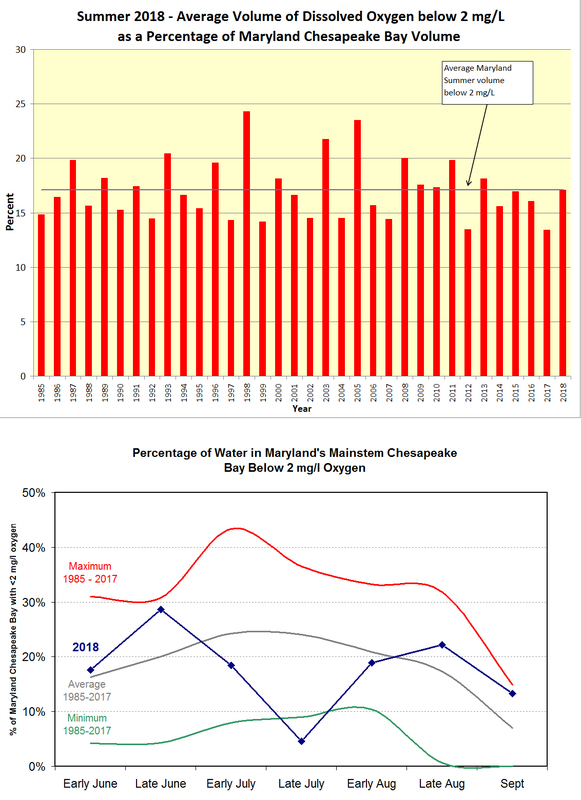 The record low Maryland hypoxia exhibited in late July followed by the near record high hypoxia in September demonstrates the extreme dissolved oxygen variability over relatively short time periods due to weather events. Over the long term, hypoxia has been decreasing, partly attributed to nutrient reduction strategies as documented in the literature (Murphy et al., 2011), but during high flow years such as 2018, greater than average nutrient loads with prolonged warm weather can increase hypoxia. “These monitoring results generally match the findings of the Virginia Institute of Marine Sciences hypoxia model and their 2018 Annual Hypoxia Report Card. Variations in results are partially due to different reporting periods and locations. 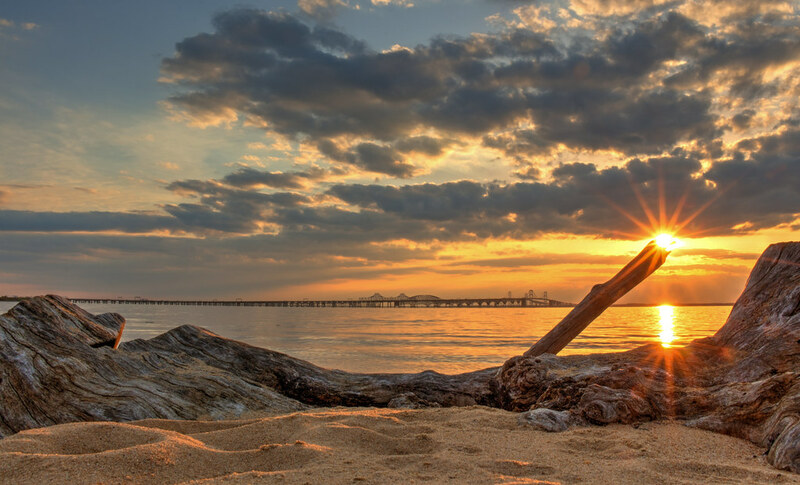 The Virginia report includes May through October results for the full bay, while the department reports on Maryland conditions from June through September, the time period that specifically relates to the summer dissolved oxygen water quality criteria assessment. In the beginning of June, National Oceanic and Atmospheric Administration, U.S. Geological Survey, University of Maryland Center for Environmental Science and University of Michigan scientists predicted a slightly larger than average hypoxic volume for Chesapeake Bay due to higher spring flows (January-May) and nitrogen loading from the Susquehanna and Potomac rivers. Data collection is funded by Maryland and Virginia and the U.S. Environmental Protection Agency’s Chesapeake Bay Program. Bay hypoxia monitoring and reporting will resume next summer.